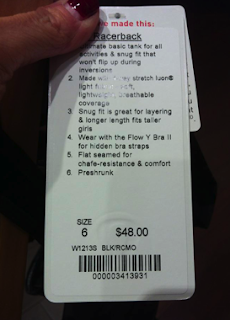 After a few days of confusion with the price tags on the latest Cool Racerback Tanks (priced at $48 up from $42 – earlier in the year they were $39) and no real answers given, it seems as though Lululemon is increasing prices once again – Lululemon just doesn’t want to say it out loud. Initially the GEC response was that no, the tags were a mistake and that price is only for special edition tanks. Some people were being charged the correct price of $42 in stores when the CRB’s were scanning in at $42, others were being charged $48 and then given refunds when the price discrepancy was brought to the cashiers attention, and others were told a flat out no, the price is indeed correct at $48. Guest Education has been asked several times thru Facebook, phone call and the online chat feature on the website what the correct price is for these tanks and wether or not we will be seeing price increases for all Cool Racerbacks and the response has changed from ‘no’, to ‘yes’ to ‘let me get back to you’. 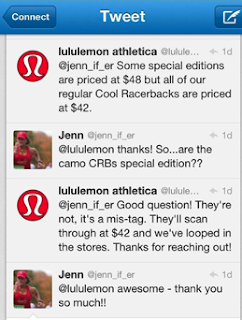 Still waiting on the response to the question I asked yesterday on the lululemon facebook page. Surely there is someone at Lululemon headquarters that is in charge of pricing and knows the answer to this simple question. What is the correct price for the Camo Cool Racerback Tank? Are the prices going up for all Cool Racerback Tanks (that have a print, line, are static or heathered)? Is anybody there? Can somebody hear me? So it seems that either all Cool Racerback Tanks will now be priced at $48…or all printed Cool Racerbacks will now be considered ‘special edition’ when they were not before. Which is kind of annoying because how many solid Cool Racerbacks have we seen this past year? 3? I remember Currant and Surge. We have heathered and static and wee striped and printed..will those all be considered ‘special edition’ now? We’ve already witnessed lululemons failed price increases with the Special Edition Scubas, Limited Edition Scubas and basic scubas being called special edition because of stripes. ALL ENDED UP IN MARKDOWN. And are sitting there in markdown. Will we show Lululemon that we approve of the price increase with Cool Racerback Tanks like we approve of the ridiculously priced scubas and just let them sit there unsold? They got away with the original price increase with the Cool Racerback Tanks by slapping a ‘reversible’ label (how much do those cost?) and an iron on logo on tanks that have always been reversible. I’m afraid that is probably my threshold for price on these tanks. "Lululemon Push Ur Limit Tank is Back!!" I asked this question at my local store today and was told that due to the "special dying process" the camp CRBs are $48. Kind of silly IMO.